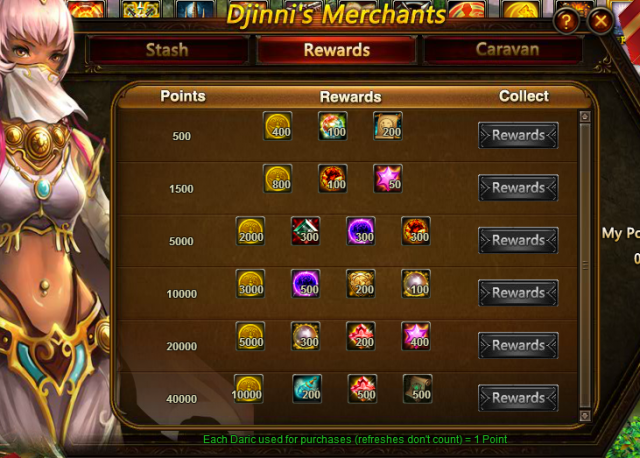 This time a variety of totems are added in Djinni's Merchant. 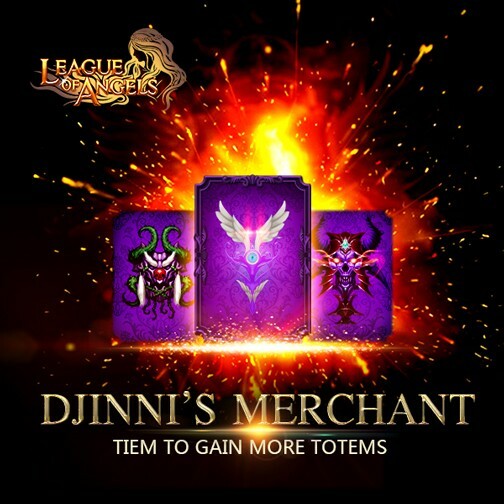 Seize the chance to get more totems! Immortal Guard Totem, Accursed Totem, Spiritsoul Totem, Divine Totem, Sanctuary Totem, Arachinid Totem, Spirit Essence, Khaos Core, Lvl. 8 Superior Gem Chest, Purgatory Soul, Adv. Energy Card(50 Pts) and more will be waiting for you! Come on! The more you buy, the higher the discount will be! 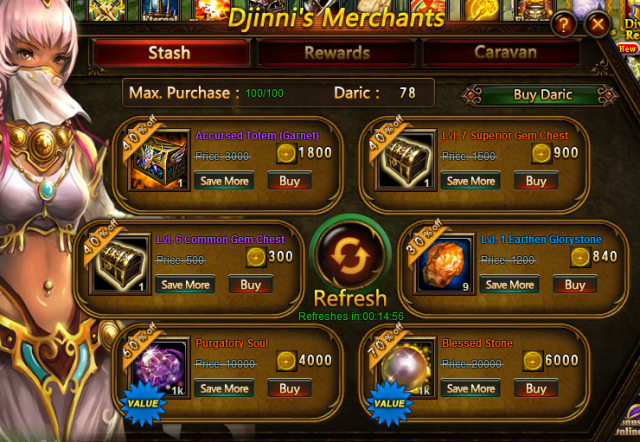 - Daric can be obtained from Hot Events, or exchanging Diamonds or Vouchers at a 1:1 rate. - Click the “Refresh” button for a chance to buy different discounted items. The commodities include Lvl. 1 Brooky Glorystone, Lvl. 8 Common Gem Chest, Lvl. 7 Superior Gem Chest, Lvl. 7 Common Gem Chest, Energy Vitamin, Legendary Exp Totem Chest, Rare Exp Totem Chest, Purgatory Soul, Grotto Heart, Energy Card, Enchanted Ore, Element Scroll, Blessed Stone, Soulstone, Seraph's Stone, Gem Enhancement Stone, Element Crystal, Aegis Shard, Refining Stone, Runestone, Angel Tears, Gold, and many more. More exciting events are coming up through April. 20 to April. 26 (server time). Check them out in the in-game Hot Events menu now!